Don’t think you have to ride with cleats just because other Bike Northers do! And if you do choose cleats, don’t be afraid to ease the release settings. Cleats, like toe clips, help to locate your feet on the pedals. This is important, because if your foot slips off the pedal, you are in danger of overbalancing, and the edge of the pedal will probably carve a groove into your shin or calf. For the many years before cleats appeared on the scene I rode with toe clips. But I never tightened the leather straps because, unlike racing cyclists, I never felt the need (or had the strength) to lift one pedal while pushing down on the other. Apart from the fiddle of flipping the pedal around to get my foot into the clip after starting off, they worked well. But eventually I succumbed to the lure of the new technology, buying SPD shoes and pedals. Like most people new to cleats, I fell off the first time I stopped because of forgetting to un-cleat. To prevent this happening again I backed off the tension of the pedal adjustment to its loosest position, planning to increase tension when I got used to cleats. But I have never found the need to do this; the minimum setting is adequate to stop my feet slipping off the pedal while riding, while offering little resistance to un-cleating whenever necessary. 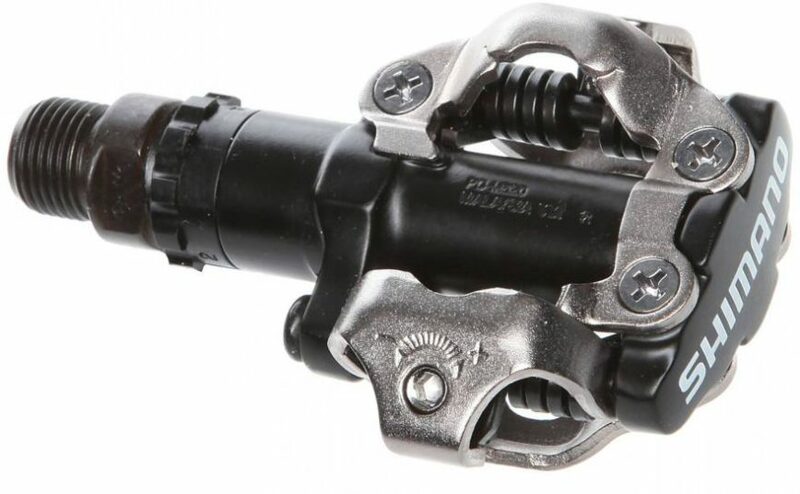 The adjustment of the cleat’s release tension is on the pedal, not the shoe, and you’ll find lots of on-line explanations and videos showing how to adjust the tension. 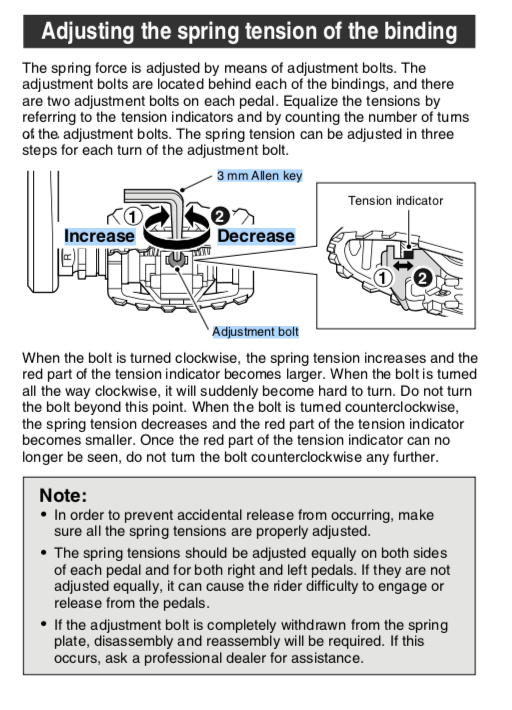 I found this one on Shimano’s instruction leaflet for their D-M545 PD-M424 SPD pedals (see below). I now have cleated pedals on most of my bikes, all set to minimum tension. On those bikes which I might ride with street shoes I have single-sided SPD pedals (such as Shimano M324), with a cleat on one side, and normal pedal on the other. With cleated shoes I can flip the pedals over to the non-cleated side when approaching a tricky manoeuvre or preparing to stop. Alternatives to cleats? Few people apart from track racers still use toe clips, but for just riding around I like the ‘mini half-clip’. Most half-clips are sold for children’s bikes, and are too soft to be much use for adults, but on my shopping bike I use ‘Zefal Christophe 45 Half Toe Clips’, which are stiff enough to stop your foot sliding forward. They’re hard to find in Australia, and you’ll probably have to order them from overseas (many English bike shops stock them). Another option, favoured by Fixie riders, is ‘Power Grips’, which consist of a strap fitted diagonally over the pedal to allow you to insert and release your foot easily. What about Road cleats? I can’t comment on road cleats, having never used them, but they seem to make walking difficult, whereas the cleats on my SPD-style shoes are fully recessed, allowing me to walk normally.